1/4 cup (calculated without chips) equals 35 calories, trace fat (trace saturated fat), 0 cholesterol, 195 mg sodium, 7 g carbohydrate, 1 g fiber, 1 g protein. 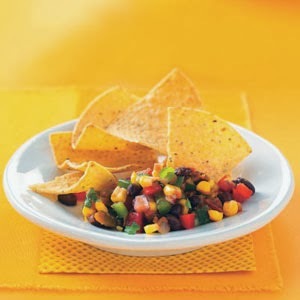 In a large bowl, combine the beans, corn, tomatoes, peppers, chilies, onion, cilantro, lime juice, garlic, sugar, salt and cumin. Stir in salsa until blended. Serve with chips. Yield: 28 servings (1/4 cup each).